The Business Law Guide to Belgium is essential reading for all companies doing business in Belgium, as well as for their legal advisers. This book is a time- and money-saving companion that deals with the legal aspects of most commercial scenarios from a practical point of view. Topics covered in the book include company law, mergers and acquisitions, accounting law, taxation and tax law, customs and excise law, financial law, employment law, residence and work permits, distribution law, E-commerce rules, intellectual property law, antitrust law, unfair trade practices, property law, environmental law, state aid rules, product liability law, data-protection rules, judicial composition and bankruptcy, and litigation and arbitration. 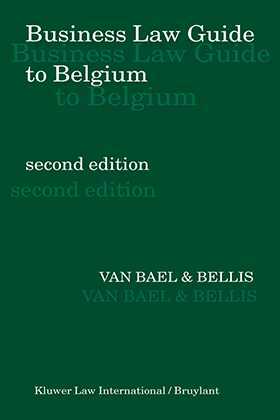 Written by a team of Belgian lawyers at Van Bael & Bellis, this book reflects their day to-day experience with respect to the complex legal issues that arise under Belgian business law. This book is the only comprehensive treatise of Belgian business law available in English. Established in 1986, Van Bael & Bellis is one of the few independent international law firms based in Brussels. It advises companies from around the world on international trade law, antitrust law and Belgian business law, including corporate transactions and litigation.